Since its publication seventy years ago, Antoine de Saint-Exupéry's The Little Prince has captivated millions of readers throughout the world. It may come as a surprise that this French tale of an interstellar traveler who comes to Earth in search of friendship and understanding was written and first published in New York City, during the two years the author spent here at the height of the Second World War. As he prepared to leave the city to rejoin the war effort as a reconnaissance pilot, Saint-Exupéry appeared at his friend Silvia Hamilton's door wearing his military uniform. "I'd like to give you something splendid," he said, "but this is all I have." He tossed a rumpled paper bag onto her entryway table. Inside were the manuscript and drawings for The Little Prince, which the Morgan acquired from her in 1968. Focusing on the story's American origins, this exhibition features twenty-five of the manuscript pages—replete with crossed-out words, cigarette burns, and coffee stains—and all forty-three of the earliest versions of drawings for the book. Also on view are rare printed editions from the Morgan's collection as well as personal letters, photographs, and artifacts on loan from the Saint-Exupéry estate, private collections, and museums and libraries in France and the United States. Lead funding for this exhibition is provided by Barbara and James Runde, and by The Florence Gould Foundation. Generous support is also provided by Air France, Liz and Rod Berens, and the Caroline Macomber Fund, with additional assistance from Houghton Mifflin Harcourt. 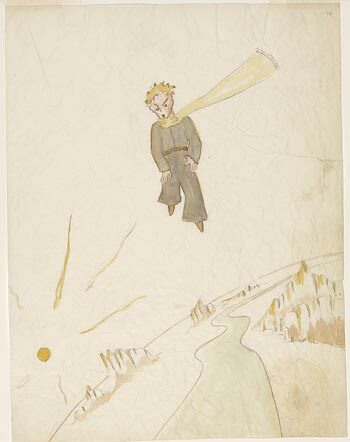 Antoine de Saint-Exupéry (1900–1944), drawings for The Little Prince, The Morgan Library & Museum, New York, © Estate of Antoine de Saint-Exupéry. Photography by Graham S. Haber, 2013.